As the season winds down I go to my photo library to see what worked this past season and what didn’t. One of the overwhelming successes was using a never-sat-on garden bench for plant display. Although this bench is in the fragrance garden we never sit there, prefering the deck, or under the shady arbor since both spaces look over at this garden. But since this flat, level surface is in full sun it’s perfect for displaying pots of succulents. Tables, chairs, plant stands intended for the indoors, wagons, garden carts, barrels, wooden crates, stools, stacks of bricks, logs, upside down flower pots, and beyond. Check in your basement, garage and garden shed and just make sure that what you choose is sturdy enough to hold a heavy pot and not blow over. Group objects together that are assorted heights, or use one level surface such as this bench which was made from locust logs stuck in the ground topped by an old slate top recycled from a lab bench. As I wrap up this growing season, I’m already getting excited about the possibilities for next year. 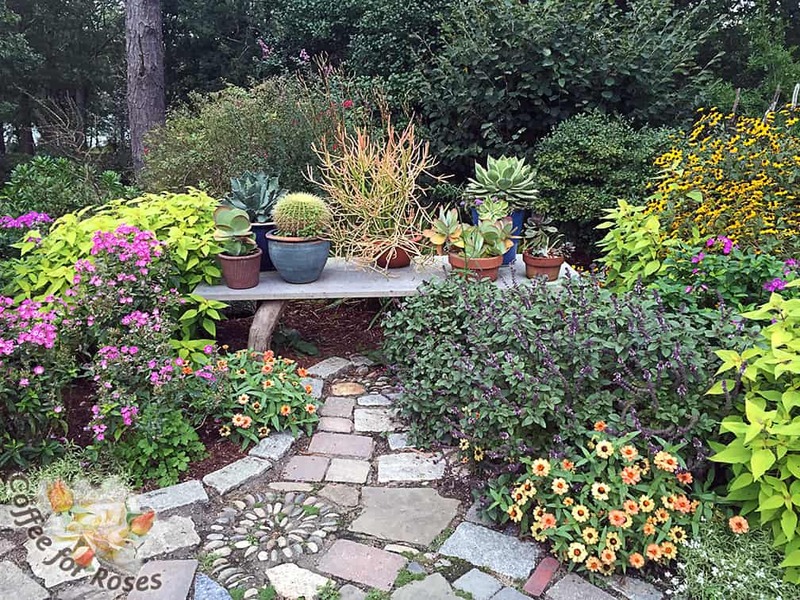 There’s a big recycling theme going on in this garden, from the bench made of an old slate labratory bench to the flooring made of recycled pavers, cobblestones and scraps from the counter-top store.